Renal transplantation remains the best treatment option for patients with end-stage renal disease for their survival and quality of life. There is a significantly increased risk of malignancy in renal transplant recipients as a result of the use of immunosuppressive medication. On the other hand, renal cell carcinoma (RCC) of the native kidney accounts for <5% of all malignancies found in transplant recipients. Fluorine-18 Fluorodeoxyglucose (FDG)-positron emission tomography (PET)/computed tomography (CT) is the imaging tool used in the staging of RCC. Our case describes the image findings of F-18 FDG PET/CT in a case of native kidney RCC with liver and bone metastasis in a renal transplant recipient. A 55-year-old male, postrenal transplant done 5 years before, presented with back pain. ultrasound abdomen was done which showed a hypoechoic lesion in the right native kidney, suspicious for malignancy. 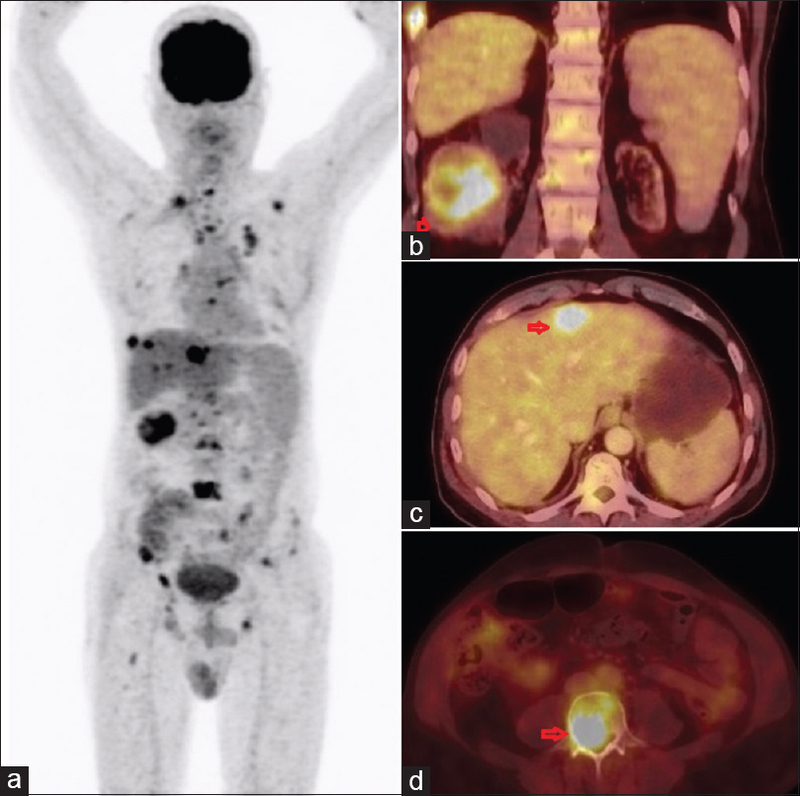 He was referred for the whole body F-18 FDG PET/CT [Figure 1] for staging which showed a cystic lesion in the native right kidney (with a SUVmax of 10, arrows), hypodense liver lesions and multiple skeletal lesions (SUVmax of 15, arrows). He underwent renal biopsy which showed clear cell carcinoma and started on tyrosine kinase inhibitor and is on follow-up. The incidence of RCC in native kidneys of renal transplant patients varies between 0.3% and 4.8%. The risk is increased in patients with acquired cystic kidney disease (ACKD), in men, recipients aged at least 65 years, those with a longer pretransplant dialysis interval, a donor aged at least 50 years, and microscopic hematuria. In patients with ACKD, the prevalence is 19% and in patients with complex cysts, it is 54%. Papillary hyperplasia of cyst epithelium is recorded in virtually every detailed pathology report of tumors arising in ACKD and is the likely pathogenetic basis for the development of renal tumors in cystic kidneys complicating dialysis. A recent study showed that the occurrence of native renal cysts that is even a single cyst confers a 1.7-fold higher risk of developing RCC in renal transplant recipients. The influence of immunosuppressive agents on cyst formation remains poorly understood. Unlike other locations, immunosuppression appears not to increase the risk of developing malignant changes in native kidneys, as suggested by the identical incidence of RCC in heart transplant patients and the general population. The diagnosis of native kidney RCC in renal transplant recipients is difficult. It is typically an incidental finding during ultrasound scan or computed tomography for other clinical indications. In fact, most tumors are small and asymptomatic at presentation. In a retrospective study, the median native kidney tumor size was 2 cm. Surgery is the preferred treatment as it is curative for the majority of RCC without metastasis. The patient showed liver and skeletal metastasis, so he was started on targeted therapy. Unlike for most other malignancies, application of FDG PET/CT is limited for RCC, mainly due to physiological excretion of FDG from the kidneys, which decreases the contrast between renal lesions and normal tissue, and may obscure or mask the lesions of the kidneys. FDG PET/CT has potency as an imaging biomarker to provide useful information about patient's survival. Pretreatment SUVmax assessed using FDG PET/CT can provide helpful information for clinical decision-making as it can serve as a useful prognostic marker for patients with advanced RCC. High SUVmax in patients with primary RCC is suggested with correlate with a high likelihood of metastasis, and FDG accumulation may be useful in estimating patient's survival. There are still no case reports of FDG PET/CT showing native kidney RCC in a transplant patient with liver and bone metastasis. In conclusion, metastatic RCC can present as native kidney mass in a renal transplant recipient with liver and skeletal metastasis. F-18 FDG PET/CT scan allows detection of the metastatic sites making it a powerful diagnostic tool for an assessment of the extent of disease in patients of aggressive RCC. Kasiske BL, Snyder JJ, Gilbertson DT, Wang C. Cancer after kidney transplantation in the United States. Am J Transplant 2004;4:905-13. Klatte T, Marberger M. Renal cell carcinoma of native kidneys in renal transplant patients. Curr Opin Urol 2011;21:376-9. Schwarz A, Vatandaslar S, Merkel S, Haller H. Renal cell carcinoma in transplant recipients with acquired cystic kidney disease. Clin J Am Soc Nephrol 2007;2:750-6. Goh A, Vathsala A. Native renal cysts and dialysis duration are risk factors for renal cell carcinoma in renal transplant recipients. Am J Transplant 2011;11:86-92. Cheung CY, Lam MF, Lee KC, Chan GS, Chan KW, Chau KF, et al. Renal cell carcinoma of native kidney in Chinese renal transplant recipients: A report of 12 cases and a review of the literature. Int Urol Nephrol 2011;43:675-80. Doublet JD, Peraldi MN, Gattegno B, Thibault P, Sraer JD. Renal cell carcinoma of native kidneys: Prospective study of 129 renal transplant patients. J Urol 1997;158:42-4. Liu Y. The place of FDG PET/CT in renal cell carcinoma: Value and limitations. Front Oncol 2016;6:201.